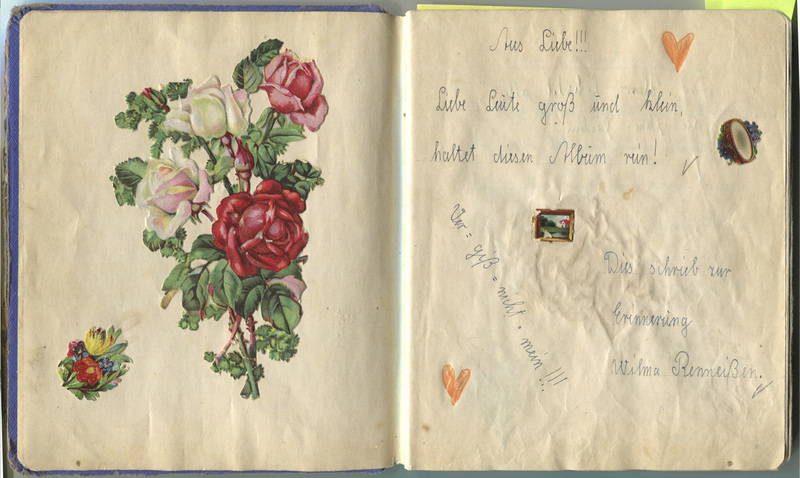 December 1941: A page in my grandmother’s friendship book. 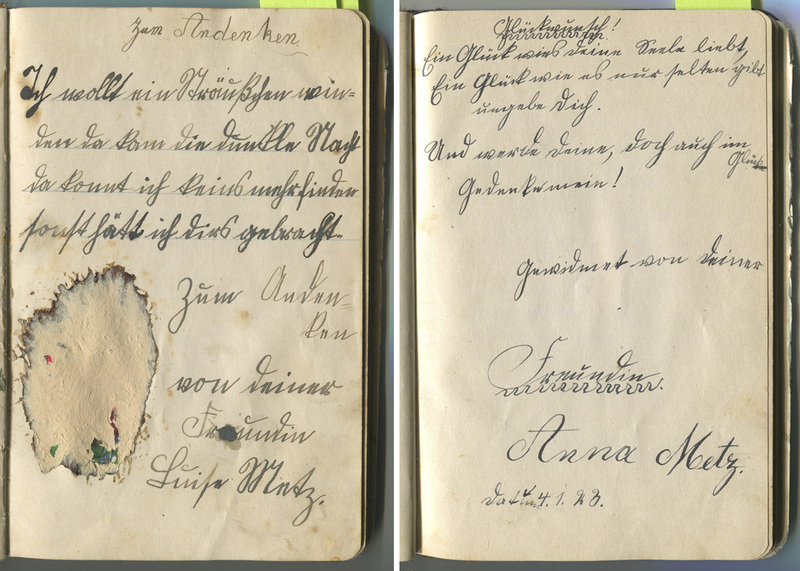 Still written in Sütterlin, although the script was officially forbidden since September. 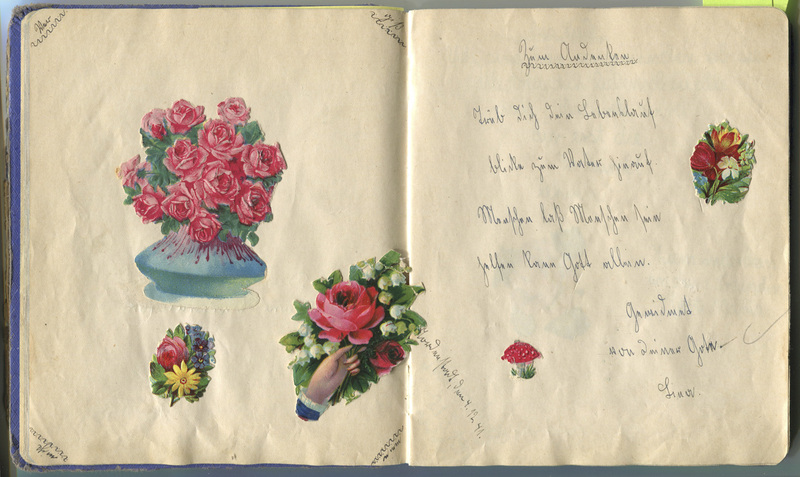 This year my mother showed me my grandmother Wilma’s and my great-grandmother Frieda’s friendship books. Both books are filled with poems about friendship, youth and life, little proverbs their little friends wrote to them. Often the pages were adoringly embellished or decorated with prefabricated illustrations of flowers, cute animals and children out of some super-idyllic fantasy world. There are entries from every month in these books, but noticeably many of them in Decembers. The cold months were obviously the time for this sort of thing. My great-grandmother Frieda’s book has entries from December 1919 to 1939. My grandmother Wilma’s book shows entries from December 1941 to 1947. I am oddly fascinated with these books, because the innocent wishes from 7-to-10-years old children stand in such a crass contrast to the awful and extreme things which also happened at these times. To see these books was obviously intriguing on a personal level, but also very interesting from a designers/type designers perspective because many entries are written in Sütterlin, an old German handwriting style. Sütterlin is familiar enough to normal Latin handwriting that it makes you think you should be able to read it, but in the end you usually cannot. Some letters are very similar to their modern equivalent, some are completely different. A little cheat sheet for Sütterlin from the Schiller-Museum in Weimar. Letters like e and s which are used very frequently look very different to their Latin equivalents. 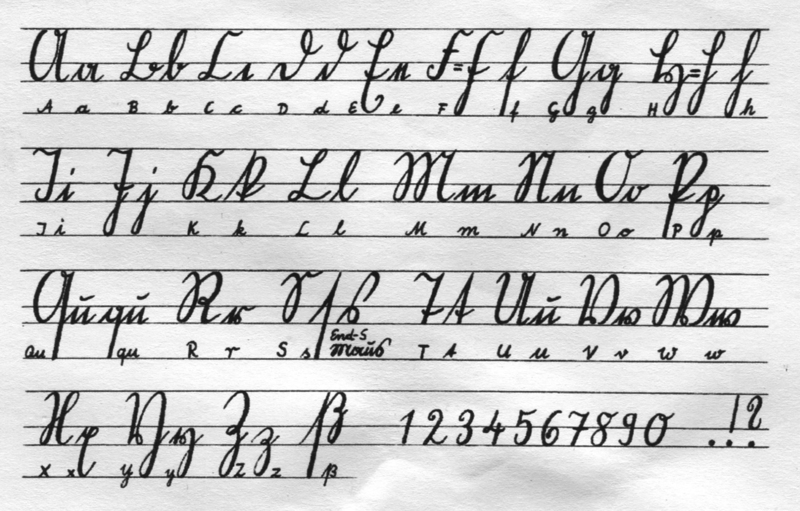 The script was invented by the graphic artist Ludwig Sütterlin who, in 1911, was commissioned by the Prussian Ministry of Science, Art and Culture to create a modern handwriting script. (Create a new script? Really guys, who wouldn’t want that sort of commission?) This new script was supposed be easier to write and learn for children than the very inclined and decorative scripts which were en vogue at the time. Sütterlin was written very upright, had shorter ascenders and descenders and was written without contrast. It has very little round forms, especially in the lowercase, and depending on the writing hand can look quite spiky. 1915 it was officially introduced in Prussia and then slowly began to replace the other styles in Germany. Since 1935 a modified version became the official script (“deutsche Volksschrift”) and was taught in schools. 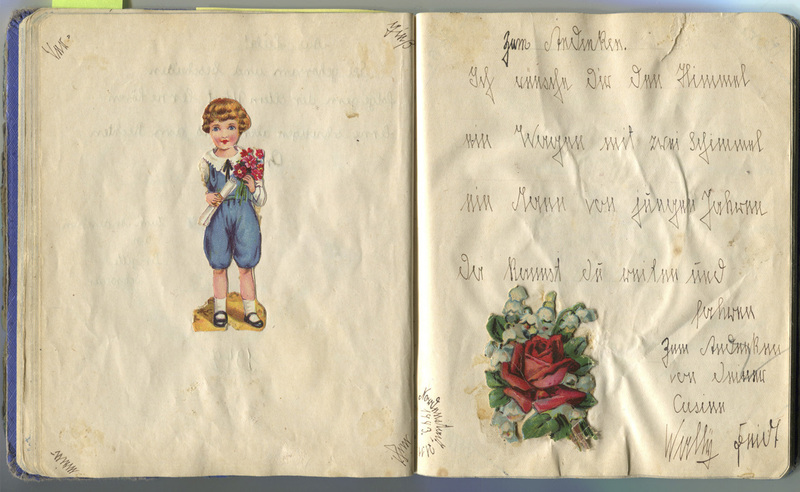 Pages from my great-grandmother Frieda’s friendship book. The right page is dated with 1923. The left has no date, but should also be from around that time. The text is mostly written in Sütterlin. The writers had the same family name “Metz” (on both pages last big line, last word). On the left side the name is written in Sütterlin, on the right it is written in Latin. This example in Frieda’s book is from 1939. It is written in Sütterlin, although in a much spikier style. In 1941, about 26 years after its introduction in Prussia, Sütterlin together with Blackletter was officially forbidden by the Nazi government and everybody was to change to Latin type and the Latin handwriting style. 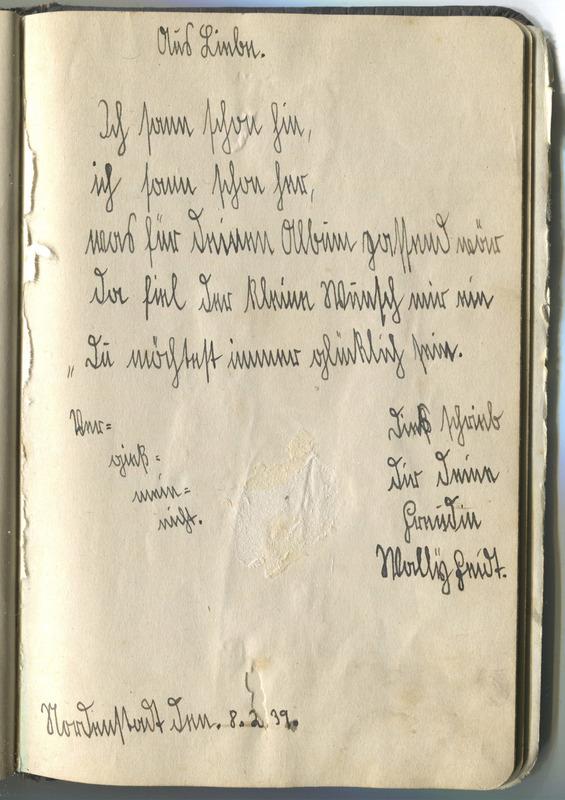 Ones own handwriting is such a unique and personal thing, for this suddenly to be forbidden and to be obligated to change to another style must have been extremely difficult for a lot of people and as we see in the friendship books, some people still wrote Sütterlin after 1941. Also for the children and grandchildren it is difficult now, because although I can remember a little Sütterlin workshop in primary school, I cannot fluently read what my own grandmother or great-grandmother had written. It requires some extra effort to research, remember and stay connected to your past. My grandmother Wilma got her book as a birthday present when she was seven years old. The entries are from December 1941 to 1947. There is not so much Sütterlin in this book, but here and there you can see bits and pieces of it, having survived the ban (also see title image). This is the first entry from my grandmother in her friendship book which she got for her seventh birthday. There is no date on the page, but it should be Winter 1941/42. As you can see it is already written in Latin script. 1943: Here Sütterlin is mixed with Latin letters. The first line shows the Latin e and later on mostly the Sütterlin version is used. Nowadays Sütterlin has almost completely vanished from our lives in Germany. Only on rare occasions when you get hold of an old diary or such a friendship book you remember the script. And since it is December, and that seems to be the time for friendship books, I would like to share this with you now. This article was originally published on the fantastic Alphabettes blog. Learn more about typography, typeface design and lettering from and with the wonderful women working in this field.